Our church will be looking at 1 Corinthians both in our sermons and CG bible study materials. I have done 1 Corinthians before in my classes but I have forgotten most of it and it will be good to get into it again. With that, I went searching for the commentaries I have which I can read and refer to. Too bad the Preaching the Word series do not have a volume on 1 Corinthians yet. As much as I needed those books in class back then, I'm feeling it's an overkill for the context I'm in right now. I have enjoyed the historical background study in all my biblical study classes, and this book should be a gem to have. 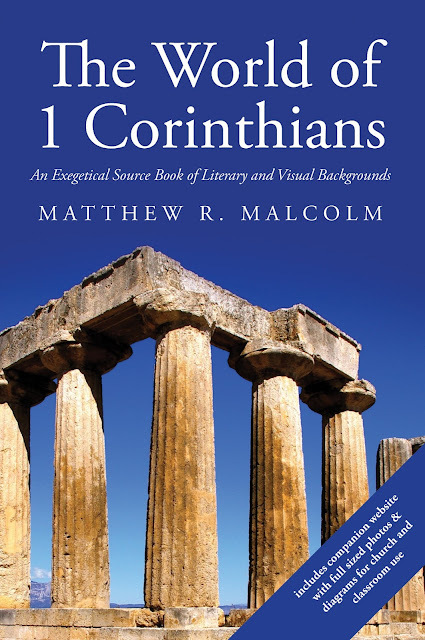 What more, Malcolm states that, "In recent decades, 1 Corinthians has perhaps received more investigation and speculation regarding historical backgrounds than any other biblical book." I will certainly be planning to buy a copy of this book real soon.